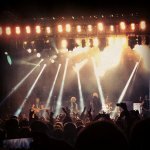 Def Leppard played a show at the Blues Festival in Skanevik, Norway last night and setlist details are available. The band played a 14 song set in a show that took place at midnight in a tent on the festival grounds. 7 songs were played from the 'Hysteria' album with 'Gods Of War' dropped from the set. 'Wasted' returned as the extra second encore as it did in Helsingborg. Played for the first time in Norway since 5th October 1996 in Oslo on the Slang tour. Back in the show after last being played in Helsingborg. And possibly for the first time in Norway.